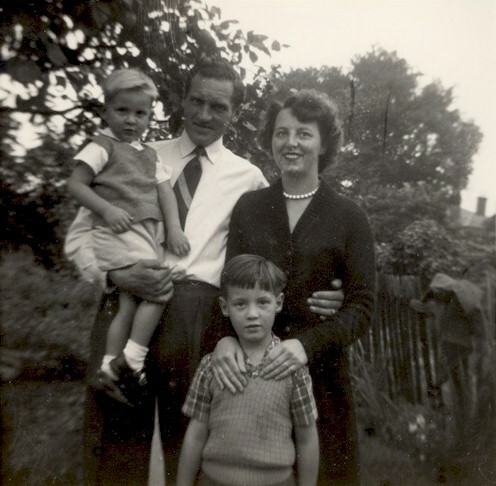 I moved to 147 Clyde Road in 1956 with my brother, Trevor, and parents, John and Ruth Hall, shown here in the back garden. IN THE BACK GARDEN OF 147 CLYDE ROAD I was only five at the time so much of what is written here comes from by mother. 147 Clyde Road was a General Store when we first moved in and we occupied the three rooms above the shop. We were allowed the use of the kitchen at the back for cooking and bathing in a tin bath!! The toilet was outside. Sometime after we moved in the shop closed and we took over the shop and store room and converted then living rooms. The houses around there were really in a bad state when we left, I especially remember all the damp on the walls. 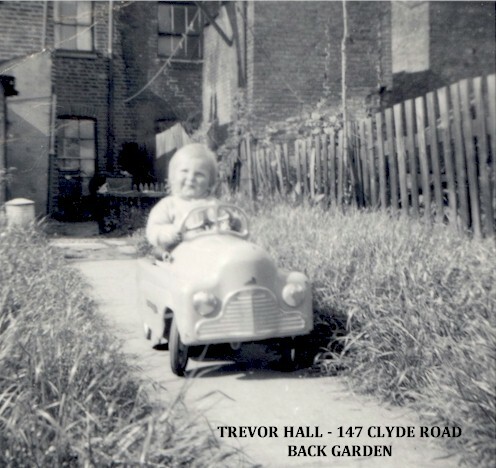 This photograph shows the back of the house, with my brother in his car!! 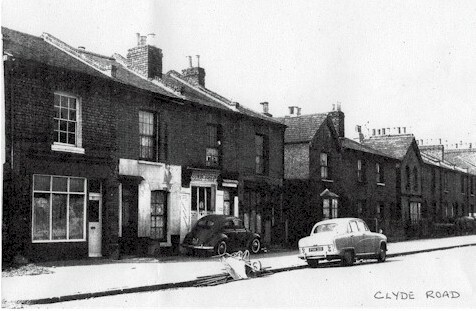 The house next door on the right was demolished some time later before we left in 1963 and left as an open site. REAR OF 147 CLYDE ROAD My father was a keen gardener and since we had elderly neighbours he volunteered to look after their gardens for them. In fact the fences were sometimes removed, especially for the large Guys Fawkes Night celebrations we had. This was one of the highlights of the year, going out with the guy for pennies and collecting wood for the large bonfire. 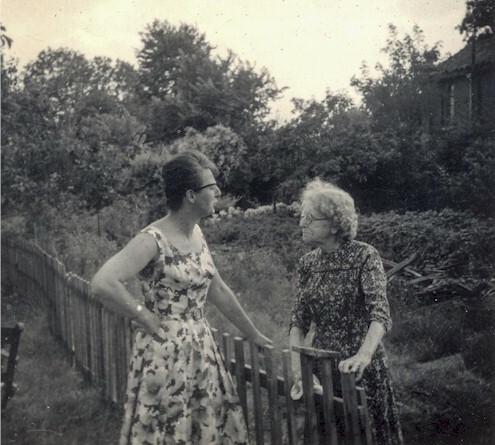 Our immediate neighbour, at 149, was Mrs Heath shown here with my mother in the back garden. You can also see a cottage in the background. I believe that this cottage was behind the other houses on Clyde Road and was at the end of a lane off Clyde Road. 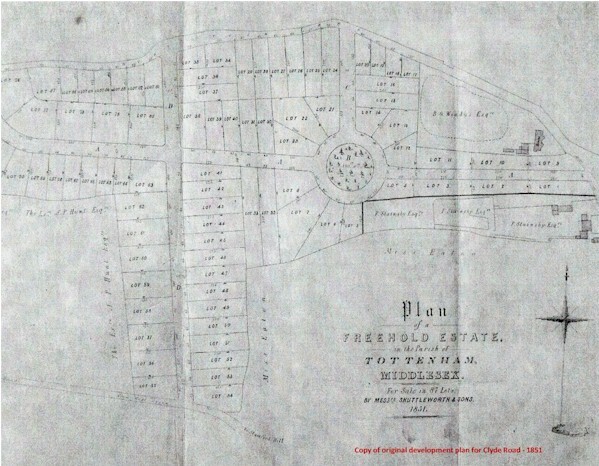 This would have been the first block of houses on the left coming from the Lawrence road junction away from the Clyde Bakery. My overriding memory of the bakery was going along first thing on a Good Friday morning and finding all the racks filled with Hot Cross buns. 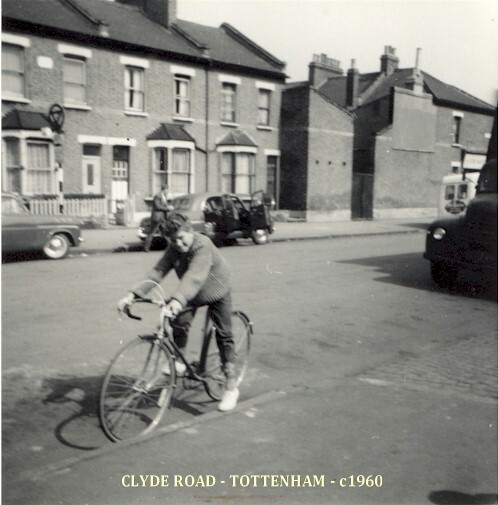 I attended Downhills Infant and Junior School and remember walking past an abattoir at the end of Clyde Road possibly on Summerhill Road. My mother worked at the Thorn Electric Company in Lawrence Road. I vaguely remember one night a very large fire in Lawrence Road, although my mother does not remember it ! John & Renee Howard: Who lived over the Cafe on the corner of Clyde Road and Lawrence Road. Lily Weller: Who lived across the road from our house. George Hitch: Who leased the shop before we took it over. Vi and Walter Thorpe: (and their daughter Heather). 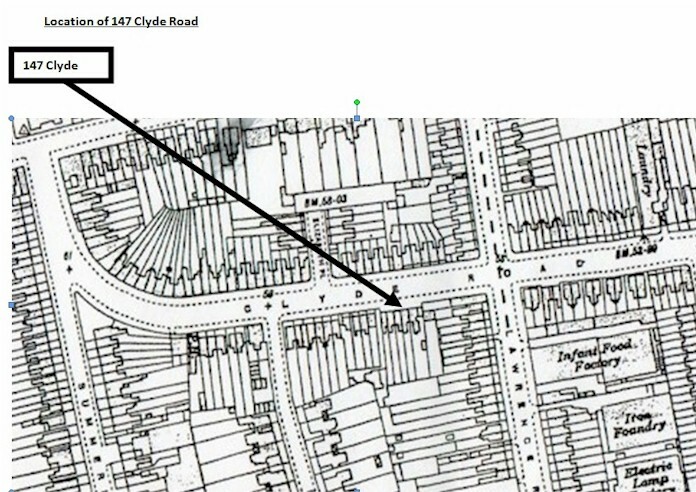 Who lived in Clyde Circus.